A dreaded Lashkar-e-Toiba (LeT) terrorist, killed in Hajin area of Bandipore, by the joint team of security forces was not doing 'jihad' in Kashmir. This is not “jihad” (armed crusade) but “jahalat” (benighted), a village elder pleaded to Pakistani terrorists. A dreaded Lashkar-e-Toiba (LeT) terrorist, killed in Hajin area of Bandipore, by the joint team of security forces was not doing ‘jihad‘ in Kashmir. He was only exploiting a young girl and forcibly trying to marry her against her wishes. According to Jammu and Kashmir police, “Pakistani terrorist, identified as Ali (his code name) had barged inside the house of a young girl, whom he wanted to marry on Thursday morning”. But when he failed to meet her he held eight members of her family as hostages. Before his arrival in the house located in Mir Mohalla of Hajin, the family had shifted their daughter to another safe location. As LeT terrorists, insisted on bringing her back, the joint teams of security forces, who were conducting a cordon and search operation in the area, were tipped off by the local villagers about the presence of dreaded terrorist inside one of the houses where he was holding the entire family as hostages. As a joint team of security forces cordoned off the area, they issued an appeal to the terrorists to release the civilians held hostage inside the house. In the first two hours, six family members were taken out of the house safely by the security forces. The terrorists, however, kept a 12-year-old minor boy Atif Hussain and his uncle Abdul Hameed as hostages till late evening. SSP Bandiore, Rahul Malik said, as per local reports, Ali visited the house of a young girl and directed the family members to produce her. 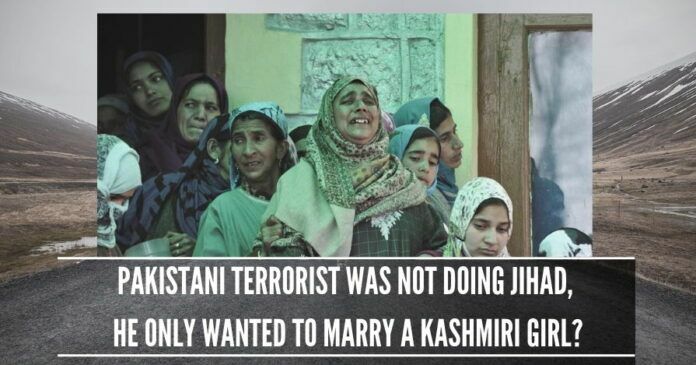 Ali was wooing this Kashmiri girl and wanted to marry her for some time. To ensure the safety of minor boy, held hostage by the terrorists, the security forces brought family members to the encounter site and close relatives including mother of a minor boy appealed to the terrorists to release him. As pressure mounted on the terrorists, they killed the helpless Atif on Friday, the police said, adding that the security forces later mounted a heightened operation and killed both the Pakistani terrorists. The house was razed to the ground and later three charred bodies were recovered from the debris. Ali had been active in the area for long and was involved in the killing of a BSF personnel and others, including the death of a man whose throat was slit in front of his son. PDP Chief, Mehbooba Mufti, very vocal on twitter posted a comment, “A minor held hostage during an encounter has been killed in Bandipore. Innocent civilians who are struggling to make ends meet have become casualties in the war between militants & armed forces. There is no method in this madness & the future looks bleak”. In the tweet, Mehbooba Mufti failed to make any reference who actually killed the minor boy. Former Chief Minister Omar Abdullah also posted a message saying, “I wish there was as much outrage in Kashmir against militants when they take a young boy hostage as there is when security forces are accused of human rights violations”. Previous articleThe law is the same for all – Did Ramesh Abhishek see it that way? Marginalised Hindus not safe in a ‘Muslim’ majority state of Jammu and Kashmir?